It is fair to say that the Flying Scot Class is one of the biggest supporters of family sailing in the US and the Association strongly supports and encourages families to sail and race together. To that end, the class holds an annual Wife/Husband North American Championship which is, perhaps, the most well attended and competitive spouses-only event in the country. 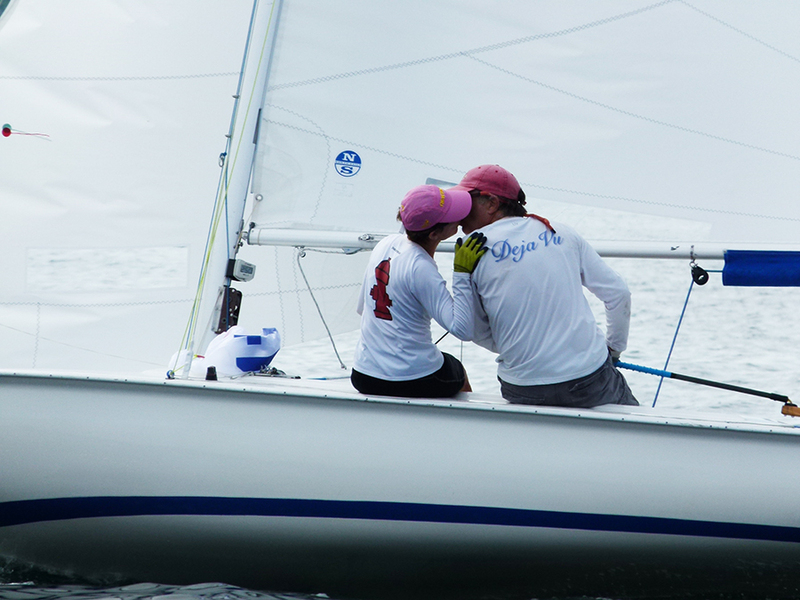 This years W/H NAC, which attracted 29 teams, was held in beautiful Rockport, MA and hosted by the Sandy Bay Yacht Club. The teams arrived Friday throughout the day and after rigging the boats they were hooked up to the SBYC hoist for the 15-30 foot (depending on the tide) descend into Rockport Harbor where all 29 boats spent either on club docks or courtesy moorings. On Friday evening North Sails Expert Brian Hayes gave a short tuning and trimming talk to the group going over rake settings, vang tension and sail trim tips before the group dispersed throughout the town to enjoy the area restaurants and shops. PRO Stephen Oulette greeted the group on Saturday morning with the traditional competitors briefing with the exception of mentioning that the protest committee would not be hearing any “intra-boat” disputes! Even though all the teams were ready to roll the breeze was not, and a 1 1/2 hour postponement was whittled away reviewing some archived Scot footage that Brian had from previous events and sharing tips with the fleet. Saturday afternoon mustered up enough breeze to create tricky “current vs. breeze” conditions with large position changes in both fleets. Sharon and John Wake figured it out in Race 1 with a 2 minute race win while Amy and Jeff Linton sailed through the fleet in Race 2 for another convincing win. Sunday brought a fresh, new wind direction and more velocity. Some teams used the wind speed/marital harmony equation and opted to sit out the days races, but a majority of the gang hit the water in a fresh 15 mph of breeze with big, open water, waves testing their abilities. Those who ventured out were rewarded with two more great races in a consistently softening breeze with Amy and Jeff Linton leading the way in both races to win the 2017 Wife/Husband Championships with 5 total points.